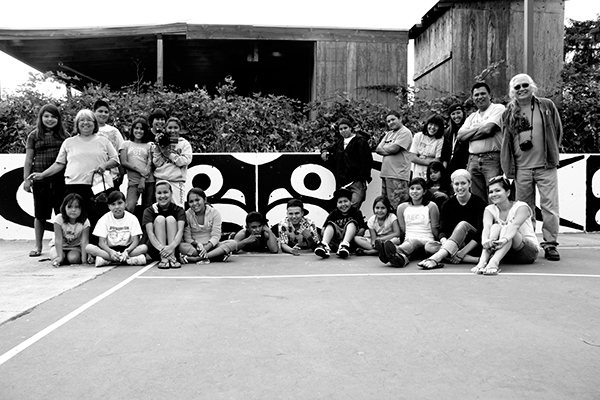 In the summer of 2009, I organized the painting of a mural on an outdoor basketball court in the heart of the Swinomish Reservation, Washington. The mural brought together over 40 community members to participate (ranging in age from 2 to 65) and painted over gang related graffiti. The design is of a traditional Coast Salish eagle, created by Swinomish woodcarver and artist Kevin Paul. As of Winter 2012 / 2013, the mural was yet to be re-tagged. I collaborated with 12 youth to create this stop-motion animation exploring identity and culture for Longhouse Media's annual SuperFly Challenge (50 youth make 6 films in 36 hours). It features a traditional jingle dress dancer, student poetry, and an original score (also created at SuperFly). Two Worlds premiered at the Seattle International Film Festival, had an extended exhibition at the Smithsonian National Museum of the American Indian, and screened at several international film festivals. This particular cut has French subtitles for its screenings in France and in Canada. This lightbox animation is the product of a semester-long animation workshop I taught at Heritage High School, a tribal school on the Tulalip Reservation, in the spring of 2010. Wanting to contribute to the efforts of the digital library of the tribe's language revitalization efforts, we recorded a traditional story in Lushootseed about the Tulalip people's relationship to the Orca whale. We then animated this story using a lightbox, black construction paper, and colored tissue paper. Native Lens students on the Swinomish Reservation reflect on the impact of tobacco on their lives, and their reasons for abstaining from commercial tobacco products. This project was commissioned by the Washington State Department of Health and the Swinomish Tribe Prevention Department. Films, animations, and visual art created in collaboration with Native Lens youth. Projects focus on cultural preservation, self-expression, and social change. The mission of Longhouse Media is to nurture the expression and development of Native artists, drawing from traditional and modern forms of storytelling, cultural identity, teaching, and inquiry.